From left- Marondamashanu Head Douglas Mazumba, Memory Matimbire, Joel Nyoni (teacher) and Munetsi Matifunga (bursar). 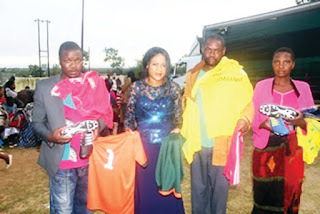 CHIVHU- Fast-growing religious group, Daughters of Virtue Ministry, which was founded by Chivhu-born Memory Matimbire on Friday donated $80 000 worth of goods to the Manyene community. The goods, which included groceries, blankets, school uniforms and stationery, were handed over to the beneficiaries during a colourful ceremony held at Marondamashanu Secondary School. Some 150 pupils at Marondamashanu Secondary benefited a set of school uniforms each. Handing over the donations, church leader Prophetess Matimbire (nee Chinyenze), a former student at Marondamashanu, said she organised the event to give back to her community. She said she sourced the donations from her followers who voluntarily contributed towards the vulnerable people in communities. Daughters of Virtue Ministry, affectionately known as Ndadhiniwa Prayer Group is a group of women from various religious denominations who come together for prayers. The religious group now boasts of more than 700 000 followers in Zimbabwe and South Africa and in 25 other countries throughout the world. Another former student at Marondamashanu Secondary, Leonard Chibamu, now a filmmaker and a Police officer based in Harare said Matimbire’s gesture was motivational to other former students. Accepting stationery and school uniforms, Marondamashanu Secondary School head Douglas Mazumba said Matimbire’s donations were in line with the school’s five-year development plan of 2017-2022 in which former students and community members are to be engaged for the school to acquire Advanced Level status.